Vacation homes sit empty most of the year, representing a huge amount of untapped inventory waiting to be discovered online. Large services such as HomeAway, VRBO, and TripAdvisor’s FlipKey are taking advantage of this market opportunity, but for many vacation homeowners managing their listings online is still too much of a hassle. They end up handing over the keys to local rental property managers instead or not even listing their properties. A new startup in Denver called Evolve Vacation Rental takes more of a white-glove approach to marketing vacation homes online. 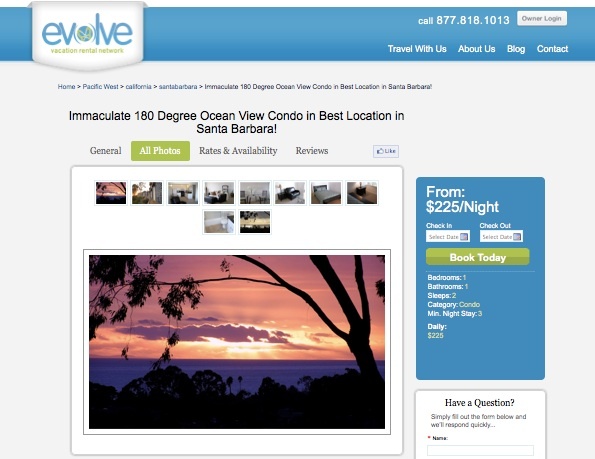 Evolve starts with a phone consultation with each homeowner, gathers the property information and photos, and then lists it across various vacation rental websites, including HomeAway, VRBO, and FlipKey, as well as its own site. The homeowners do not have to pay for any of the listings (which they would if they listed on their own). Evolve takes all the risk and if it rents out the property, it tales a 10 percent fee. In addition to pushing the listings out to as many vacation rental websites as makes sense, Evolve makes sure the copy reads well and is SEO-friendly, responds promptly to any inquiries, takes payment, and eliminates faxing with online rental agreements. It doesn’t provide on-the ground services such as house cleaning or maintenance, but will help homeowners contract those out. Evolve focuses on the online marketing, and even tests out different versions of the listings using A/B split testing. (For instance, here is a listing for a condo in Santa Barbara). Very few vacation homeowners have the time or inclination to do all of this by themselves. Founders Brian Egan and Adam Sherry were early employees of Denver-based Exclusive Resorts, which is backed by Steve Case and focuses on higher end properties and a country club membership model. With Evolve, Egan and Sherry are seeking to make the process of listing and marketing any vacation home simpler and more efficient. The startup closed a $530,000 seed round last May from angel investors including Kevin Willer, Andrew Houser, and John Anderson.